"And I too the little book out of the Angle's hand and devoured it; and to my taste it was sweet as honey; but as soon as I had devoured it, it became bitter unto my inside." "And he said unto me, you must prophesy again before many people and nations and tongues and kings." The "little book" voicing the 7 thunders, the voices of the seven planets, was the only and original test book of the mystic brotherhood. Did you ever know of another book that was made small enough to hold in the hand? Destiny cards, as we call today this "little book" of the "7 thunders", sealed for a time, has been opened to us by Olney H. Richmond, the grand master of the inner temple of the ancient order of the Magi. In his Mystic Test Book Olney says: "No other book that ever had an existence upon our planet has within itself the wonderful properties that are induvitably attached to this little book. No other book has been so sealed with hidden emblematic meanings as to defy all attempts to open its pages." 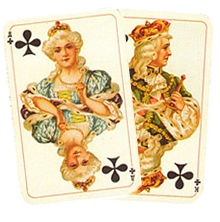 A deck of cards has been used for playing a great variety of card games, with varying elements of skill and chance, some of which are played for money. When the Gypsies emerged in Europe during the tenth century A.D. they brought the art of palmistry and card reading. Gypsy girls started learning these skills at the age of twelve. For several years they learned to memorize the meaning of each card and how to interpret the layout of those cards from their mothers. Most perceptive became well known for their ability to accurately foretell the future. But the knowledge behind the emblems and the numbers of Destiny Cards were available only to the few members of the order. They were sworn not to "cut, carve, mark or write them" upon any substance whatever, except for use in the Temples of the Mystic Brotherhood. 12 court cards - the 12 months of the year. 4 Kings, 4 Queens, and 4 Jacks establish the 12-symbol throughout the pack of Destiny Cads. The Trinity of Father-Mother-Son, Positive-Negative-Neutral is 4 times repeated by the 4 suits. Twelve stands for the "House of the Lord", the "Many Mansions" which await His children, the "Houses" of the zodiac. The symbolism of 12 is evident: the 12 months of the year, the 12 tribes of Israel, the 12 sons of Jacob, the 12 Apostles and original Disciples of our Lord. 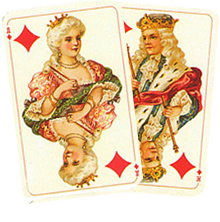 As groups of 3, the Court Cards are all rulers in their own right. Kings rules as Kings and stand at the head of the pack, but Queens are ever beside them as co-rulers. It is the great example of the fact that the genus male cannot persist without the female. No Positive can exist without Negative. No action can take place without reaction. 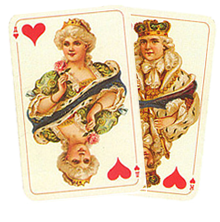 Kings represent the Positive and Active, Queens the Negative and Receptive. Jacks, being both active and receptive, represent the Neutral. Your birth card can be the one of the 12 crown cards. You can also have the court card in your life path. 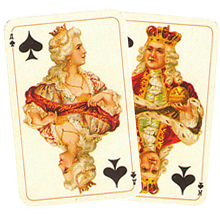 The court cards are also known as the Personality Cards for natives of any card from the Aces to the Tens. There is an esoteric significance of the Red and the Black color, but there are not applicable to the life of he individual as Light and Darkness or Ease and Misfortune. We may regard them as a pair of opposites under the Law of Polarity. 13 cards in each suit - the 12 Signs of the zodiac plus the Sun. At the very foundation of all symbolism lie mathematics and geometry. The Universe itself is built up on exact geometrical and mathematical principles. The number Seven is interwoven throughout the very warp an woof of Nature's handiwork. In all ancient books we find a divine plan of sevens extending through the pages. Composed of twice 7: 4 times 7: 8 times 7 with the Ego (number 1) added to the last figure. If you divide the number of the Infinite (100000000000000+) by 7, the end result is 142857. Keep the division to all eternity and you get nothing but the sacred number 142857 over and over. The number 7 is the center of each suit of the Destiny Cards. Multiply the sacred number by 7 and you receive a product all in nines. The number 9 represents the another phase of symbolism - the duality of the physical, plus the deific seven: 2+7=9. Therefore in Tarot we fund a wonderful blending of these two numbers in harmonious relations in thousands of ways. Destiny cards represent the full year - the amount of days the Earth travels around a Sun. Four seasons are represented by suits of destiny cards. 13 cards in each suit multiplied by 4 suits make 52 days. The 52 emblems being multiplied by the 7 planets make the days in the year, less one. There is no ruling card for the 31th of December. The Ancient therefore used the 365th day of the year as a holiday, or festival day, doing no work upon that day. The one quarter of a day that makes one full day each four year, is represented by the card of Joker. 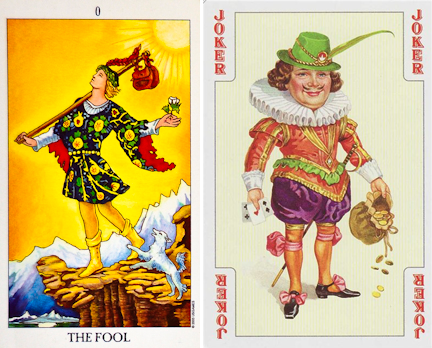 The Joker is associated with beautiful, the highest card in the Tarot pack, the Card of The FOOL. It seems that the foolish little fellow - the Joker - has not much to do with the master number 22. The initiate-teachers of old deliberately concealed much of their priceless wisdom from the "profane" by words or pictures which conveyed opposite or distorted meanings to all but the serious students. The Fool of the Tarot is the pictorial statement of the One Force, the No Thing (0) year Everything to all Men. It is all seasons, all forms, and all activities. The Joker natives, people born every December, 31 are a law to themselves. They belong in the "Crown Line" much as the other three cards. It is impossible to analyze them; they hold the key to themselves - and guard it. There are great Cosmic Patterns showing the important steps which lead to the upliftment of each of us to a point where union with the Higher Self is attainable. Perhaps the purpose of Earth evolution is to restore humanity to its full creative ability, working in harmony with the Divine Plan. There is a purpose behind the Universe, which the religious of all ages have known, and each has outlined a tentative spiritual path to super-consciousness. Within the unending cycles of birth and death there must be profound meaning. Nothing is more important for humankind to realize the Oneness of all things, of time, of purpose, of effort. Love and Law are one, even as the forces in nature are One. Each manifestation seeks to express that phase of its position given by its Creator. Only we humans abuse that position given, by our choices between good and evil. We may rise to become truly great in mastership, or we may regress many steps in character. The study of ourselves in relation to the whole - or to God - and the Oneness of all Force, will awaken something within our soul-selves to a full realization of the part we must play in future cycles of manifestation. To every one of us a door is open, a new vision. It is always interesting to see how compatible you are with someone. The Destiny Cards reveal our personality, strengths, abilities, weaknesses and psychological patters. To learn how you relate to the person, you need to understand the planetary relationships of your personal cards - your birth cards, your planetary rulers and the Karma cards by finding any relationships that exists between these sets of cards in the mundane and the spiritual spread. The Destiny Cards help us to learn more about ourselves and look at our life from a new perspective. The Destiny Cards can give you a clue and an extension and clarification of your own astrological and numerological maps, strictly calculated according to your elements, attitudes, emotions, and reactions to others - and most importantly - to yourself. Each card in our life path along with our main set of birth cards are not isolated clues, but, like all phenomena, are interlocking pieces in the vast puzzle of existence. There are no bad or good cards. There is no a "good" life paths or a "bad" life paths. There are the lessons to learn along a way, and the talents and abilities we are given to overcome any obstacles and to become successful. Each of us is unique. Although people who share the same birthday with us have a lot in common, we all have different parents and genes that exert a tremendous influence over what kind of people we become. Our life experiences are identical but the way we express ourselves in any given situation is different. Each card, each symbol and each number can be expressed positively or negatively. Through positive response to the vibrations of our birth, we can enjoy perfect piece and harmonious surroundings. Our birth cards give us a boundless opportunity for improved self-expression. Our birth cards point to a future state of illumination, our present status of evolution, and our ultimate destiny.